1833 Barney Flaherty 1st paperboy (age 10) for "The New York Sun"
1862 Robert E. Lee's Confederate army invades Maryland, start of Antietam Campaign. 1881 Thomas Edison, 1st commercial electric lighting system is switched on for 85 paying customers. 1885 Exchange Buffet opened in NYC. 1st self-service cafeteria in the U.S.
1886 Apache chief Geronimo surrenders to U.S. government troops, last major Indian war. 1888 George Eastman registered the name "Kodak" and patented his roll-film camera. 1917 American forces suffered its 1st fatalities in World War I (France) . 1945 The American flag is raised on Wake Island after surrender ceremonies there. 1971 "The Lawrence Welk Show" was seen for the last time on ABC-TV. 1998 Google founded by Stanford University students Larry Page and Sergey Brin. 2003 Keegan Reilly, 22, 1st paraplegic climber to reach peak of Mount Fuji. #25 was personal... Very personal... I had not realized, exactly one year had passed by since I was laid off. I tried to make sense of it, what all happened and why, what was God's plan... I reviewed what had happened to my family and how we were impacted: 7 months of finding ways to make money instead of a 'normal' 9-5 job. In the last year I had: Learned many new things about internet businesses, met many new people, went to countless auctions and sales, coached 5 baseball teams, went on 3 Dad & Me Days, created 2 businesses (OhiOOddities and OhiOOrigins), was appointed to the City's Landscape Board, reduced our debt, built our net worth, gained the valuable experience that we could make it, and landed another good 'normal' job. WOW, that is a lot! But why did I go through it? Why didn't things just stay normal? What was the end goal??? Well I know on of them, and it was to meet this guy, Tim Y, from work. When I first got there he had only been there a couple months. He opened up right away, showed me the ropes, was easy to work and get along with, and he is one of those guys you feel like you have known a long time and just trust. But Tim was gone a lot, and I didn't know why, and being new I wasn't going to ask. Then I found out he was undergoing chemo for prostate cancer. Tim didn't expect special treatment or slack off during this, he was at work as much as he could be and was always present on the phone. Tim and I spend a lot of time together, some of it productive, and all of it fun. 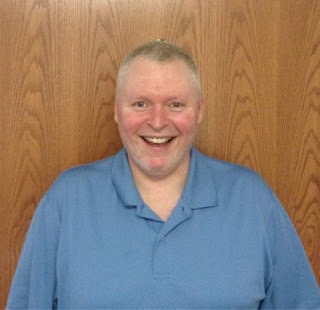 He is a great guy and makes me laugh, helps me and others through the day. Several weeks ago Tim had surgery and was out a couple weeks. But, before I am sure what his Dr. recommended, he was back on calls and email and working, and then back in the office. His hair was coming back, his color, his strength, the humor. It is great to have him around all the time again. I am inspired by his drive and determination to beat cancer, and he has! I am sure God will reveal more to me as time goes on, but this one was a clear sign; that I was brought here, to this job, through these experiences, to meet Tim. 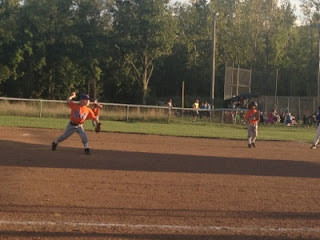 Evening events: L hosted parent information day at her school, D had baseball practice, J got grounded from his bike for riding alone in the woods at the park, G's baseball team lost their game. I lost the static IP I had had for 10 years for out internet at home and spent about three hours recovering websites, cameras and links.